I took a photo recently that shows the cross-section comparison of QuietRock 525 next to QuietRock 510. QuietRock 525 (on the left) is the 5/8" sound-dampening drywall from Quiet Solution, which seems to be partially comprised of concrete. 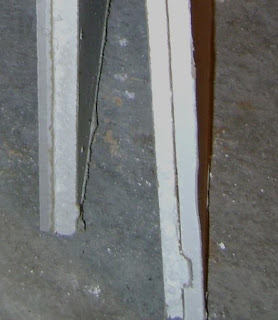 QuietRock 510 (on the right) is the 1/2" sound-dampening drywall from Quiet Solution, and seems to be comprised of two pieces of 1/4" gypsum, fused together with a membrane of other materials in between them. As I stated in my previous post, I think the most effective use of QuietRock products is to glue them with Green Glue on top of another layer of gypsum that's already affixed to the wall studs. Better still, insert insulation between the studs before you put another layer of sheetrock over the existing wall. After a month of curing, I can say that the combination of QuietRock 510 and Green Glue was the most effective of anything I've tried to date.